Tessellation is a new word for me. I heard it at a middle school of all things. The students had an evening where they displayed art, science, math and engineering projects from their efforts this year. One young man stood in the hall with many colorful pieces of paper with design on them. He explained that the class learned about tessellation to do the work. Here is a definition of tessellation from mathforum.org. A tessellation is created when a shape is repeated over and over again covering a plane without any gaps or overlaps. Another word for a tessellation is tilting. A dictionary* will tell you that the word “tessellate” means to form or arrange small squares in a checkered or mosaic pattern. 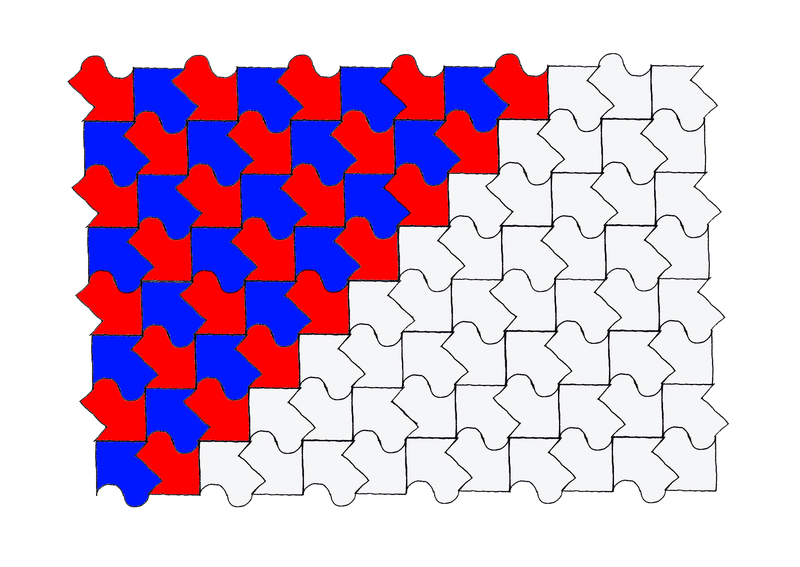 The word “tessellate” is derived from the Ionic version of the Greek word “tesseres,” which in English means “four.” The first tilings were made from square tiles. I know you have seen these patterns before. To see some interesting patterns, check out tessellations.org. One of my favorite artists, M.C. Escher used this concept in many of his works. Amiable — to describe a house? Nut graph What the heck?